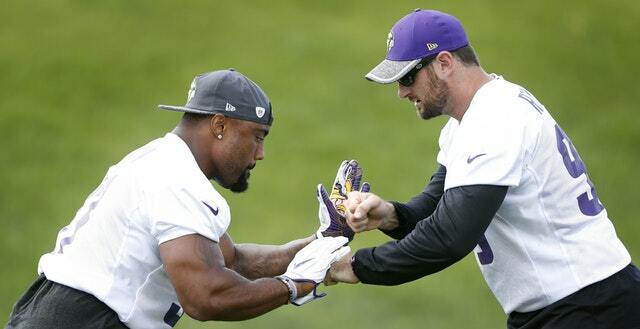 Everson Griffen missed practice all week due to an infected cut on his leg suffered after last weekend’s preseason opener in Denver, and he will not suit up against the Jaguars on Saturday at U.S. Bank Stadium. Twelve other Vikings nursing injuries or recovering from surgeries are also not expected to play against the Jaguars, including running back Dalvin Cook, who was a full go in practice this week but will not take any unnecessary hits in this exhibition. The rest of the Vikings not suiting up, according to the team: OT Rashod Hill (ankle), WR Brandon Zylstra (hamstring), G Mike Remmers (ankle), WR Stacy Coley, TE Josiah Price (knee), TE Blake Bell, DE Tashawn Bower, RB Mack Brown, LB Kentrell Brothers and DT Curtis Cothran. Center Pat Elflein (ankle/shoulder) remains on the PUP list and will not suit up. He’s yet to pass a physical and practice this preseason. Starter changes of note include tackle Aviante Collins getting the nod at right tackle for Hill, not rookie Brian O’Neill, the second-round pick who had rotated with Collins taking first-team reps for Hill during practices. Running back Latavius Murray, right guard Danny Isidora, center Cornelius Edison and defensive end Brian Robison will start for Cook, Remmers, Elflein and Griffen, respectively. Two defensive starters, linebacker Anthony Barr and nose tackle Linval Joseph, will make their preseason debuts Saturday after being held out of the opener due to injuries.